“A LAUNCH VEHICLE FOR THE TRUE PARK ENTHUSIAST LOOKING TO PROGRESS PAST THE CROWD!” Daniel Grant flies higher and further than anyone else on a wakeboard. Watch him take one lap at his favorite park and you will realize that fact. 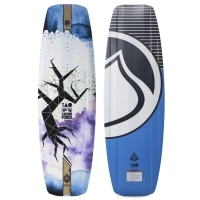 The TAO Hybrid provides the launch vehicle and landing pad that he desperately depends upon to keep progressing his riding to freakish levels. His design features a uniquely stepped deck profile that provides lively flex, and increased strength through the center of the board. This feature specifically helps the board and Daniel survive the impact of landing from 25 feet up! The wide center concave and inside channels are shaped perfectly underneath your feet to provide front and rear foot control on demand without the need for fins. The TAO is the perfect option for the true park enthusiast looking for a board that won’t ever slow their progression down! Show your unique style in the park on this all-around whip!” Nico’s all-around whip continues to allow him to showcase his unique riding style in the park. The Peak features an all- wood core with a single concave into dual channel/concave tip. This hull shape allows Nico to ride fin-less in parks with complete control. Finned up, the Peak lets you edge as hard as you can with positive hold. Mid-body edge channels and a concave beveled edge complete the package to keep your Peak performance in control and catch-free on any of your park’s features. Dialed in a bit stiffer this year to match Nico’s new flex preference, you’ll expand your riding on this updated shape. Veldig pent demobrukt (Brukt én gang). The “TAO” of Daniel Grant is all about pushing the limits. At parks all over the world, Daniel flies higher and further than anyone. The new TAO Hybrid provides the launch vehicle and landing pad that he depends upon to keep progressing his riding daily. His new design features a uniquely stepped deck profile that provides increased strength through the center of the board and a lively response, as well as a softer landing platform. The wide center concave and inside channels are shaped perfectly underneath your feet to provide front and rear foot control on demand without the need for fins. The TAO is the perfect option for the true park enthusiast looking for a board that won’t ever slow their progression down!